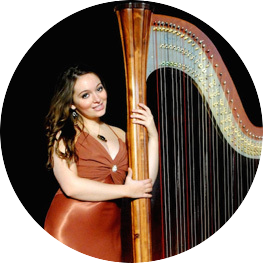 Sarah Rice is currently completing her master’s degree in Harp Performance and Composition at California Institute of the Arts in Santa Clarita, CA. She is a recent graduate of Baldwin Wallace Conservatory of Music, where she studied with Jody Guinn of the Salzedo Harp Duo. Sarah has performed with orchestras throughout the United States including the World Youth Symphony Orchestra, All-Northwest Symphony Orchestra, and the Billings Symphony Orchestra. She has also enjoyed performing with such renowned artists as Chris Thile, Jo Dee Messina, and the band, America. Sarah has produced three CD’s including original works and arrangements. During high school, Sarah studied with Joan Holland at Interlochen Summer Arts Camp. She is currently stationed in the Los Angeles area and enjoys performing with orchestras and giving solo recitals throughout the United States. Sarah’s greatest passion is for performing her own compositions and arrangements. She enjoys transcribing popular music, folk songs, and hymns for the harp. Raised in rural Montana, Sarah’s unique upbringing and love of expression bring her music to life. She also enjoys performing a wide array of genres including pop, jazz, folk, classical, gospel, and oldies and is happy to accommodate specific themes.